Today, I present a special dose from the Cardinals Nerve Center. A collection of writers that I respect and look to for an opinion when hot takes start getting tossed around like free cups of coffee(speaking of which, enjoying a warm cup of java as I type). The past month, the hot take is centered around the Cardinals and the need for starting pitching. More importantly, a need for high tier pitching. National writers Ken Rosenthal and Jon Morosi have led the charge on the topic, so it’s time I take a look. Everybody knows the worries for the Birds heading into the 2015 season. Let me break down the setup. Adam Wainwright had minor surgery over the offseason after missing time due to a “dead arm” last season. He has logged plenty of mileage on that right arm(over 1,500 innings to be close to exact). Michael Wacha suffered a stress reaction in June and was never right afterwards, even though he threw the final pitch of the 2015 campaign. Lance Lynn took big steps towards becoming a high end rotating with a composed season, so he is highly dependable. John Lackey brings his Texas grit back to the mound for another season and fingers crossed, Carlos Martinez finally gets the opportunity to unleash his full arsenal of pitches. That’s the way it looks right now. Let’s ask the panel of writers what their thoughts are on the subject of starting pitching security looking forward. The Question-If you were John Mozeliak, sitting in your office today with a brand new bowtie on, what would you do about the rotation between now and spring training? Things can develop but what are you thinking right now? Do nothing? Explore a big name? Look for a middle tier arm? Dish it out. This is a real tough spot to be in because we do not know the health of Michael Wacha, Adam Wainwright, or really Jaime Garcia. Let’s assume there are concerns over the health of, at least, Waino. I am looking for a top tier starting pitcher. Wainwright is 33-years old, has logged a ton of innings lately, and it looks like we could be seeing the start of his decline as his xFIP and strikeout numbers are lower. Should he still be considered an ace for 2015? For sure, but it is not too early to look for future replacements. 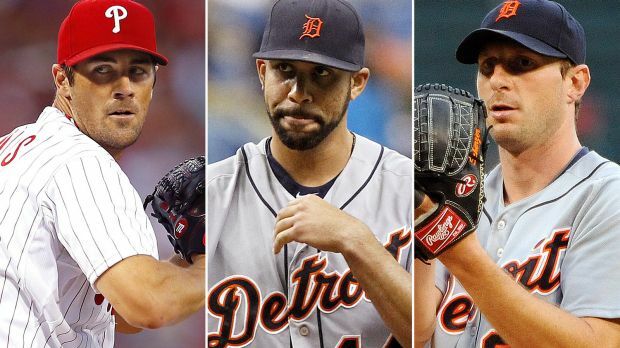 Of the big three the Cardinals are rumored to be looking at, I am eliminating Scherzer first. A 6-7 year deal for a 30 year old pitcher does not make much sense to me. Next, I will eliminate Price. While he may be the better of the two left, his contract status is really worrisome for me. I don’t want to have two “lame duck” players in 2015. You could lose both Price and Heyward. Not worth the risk for me. With that said, I am on Team Hamels. The 31-year old has 4 years left on his contract, which would probably make it the safest contract of the three. With all of that said, I am not giving up the farm for Hamels. I think the Cardinals have enough prospects to make a deal work, and I would make Carlos Martinez the only “untouchable” in the situation. If Philly’s demands are too high, you walk away. In closing, I am really concerned about the rotation going forward and would love for them to swing a deal with Philadelphia, it just has to be the right one. *You can also find John on Twitter dishing fresh takes here. Thank you for asking, Dan. I actually addressed an aspect of this topic in a “buyer beware” post on David Price for Viva El Birdos. The decline in fourseam fastball velocity, combined with him being under contract for only one season, scares me a little bit. Though I believe Price is a better pitcher going forward than both Max Scherzer and Cole Hamels, I just don’t know if the Cardinals should accept the price tag Detroit will undoubtedly apply to him. Yet, I understand if John Mozeliak feels the need to explore other options due to some relative unknowns. Unlike most, I am more worried about Michael Wacha’s health than I am about Adam Wainwright’s. I’m with John Nagel and believe that Cole Hamels could be a very real possibility should the front office be okay with parting with at least two prospects. However, if the Phillies are asking for Carlos Martinez, which wouldn’t be unrealistic given we are talking about Ruben Amaro Jr., I walk away. The most I would go for Hamels would be Marco Gonzales, Randal Grichuk, and a lower level prospect. There is no guarantee that the Phillies would even accept this, and to be honest, it pains me to even think about parting with Gonzales, as I really do see him having a bright future. Lastly, if Scott Boras and Max Scherzer stick with their $28-30 million per year price tag, the Cardinals need to run away immediately. He is one of the league’s very best pitchers, but he will turn 31 years old next season. A pitcher that age with over 1,200 innings pitched is not worth that type of deal. James Shields is the “lesser of two evils” in terms of long-term free agent contracts, but I don’t really want him all that much either. I have faith in Carlos Martinez as a starting pitcher, and I am confident he starts living up to his potential next season, especially if he throws more twoseamers/sinkers. *You can find Joe on Twitter dishing it fresh right here. There’s too much fascination with St. Louis and their prospects and draft picks. If you have a core that’s at a certain age then you need to make a power move to enhance the team’s opportunity to win. There are zero guarantees that the offense will progress in 2015 but you can control your fate by loading up on pitching.If you’re going to go for a stud. Get the biggest stud out there. David Price. Price is a big name, with big numbers and would make St. Louis the odds on favorite to win.I’d also love to see a top lefty compete out there against Alvarez, Votto, Bruce, Rizzo and the other top left handed hitters of the central.There should be ZERO hesitation on making this deal. You have the trade chips along with the payroll this year to do this. With the addition of Ballpark Foodcourt, this adds additional revenue to load up on an extension.Putting trust in the Cardinals medical staff is insane. I have zero believe Wainwright and Wacha are healthy. Don’t get caught with your pants down in April. Pull the trigger now and provide extra security. *Click Art’s name for a blunt perspective on The Cards as well as columns on the St. Louis Blues. Honesty is the only ingredient allowed in Lippo’s shop. I have been very loud on Twitter about staying as far away from Scherzer as humanly possible for so many reasons (pure cost, wild mechanics, doesn’t pitch deep in to games often enough, etc..). From this standpoint, Price is the most attractive, but from a pure cost view, he will cost more when you factor in his pending free agency as well. This leads me to think that Hamels is the most likely. If Mozeliak can lure in Hamels without giving up Martinez, then I think a trade would be VERY likely and be met with broad based approval. *You can find Corey on Twitter as well, serving up takes on the Cards, Blues, Rams and St. Louis Billikens. There is at least one legitimate question mark for every starting option for the team this year. Adam Wainwright is amid surgery rehab, yet still tasked as carrying heavy atop the rotation. Lance Lynn had what could be considered a breakthrough season, but it’s far from clear on if he is ready to take the step up the leading the staff if Wainwright falters. John Lackey is solid as a depth rotation piece, but is past the days of being a front line option. Michael Wacha has a plethora of question marks at hand: rehab from a chronic and unpredictable injury, the overlay of a rough October and an interruption in his development as well. The fifth spot in the rotation is up for grabs as is currently, with two promising properties in Carlos Martinez and Marco Gonzales vying for position. However, as with any player going into their first year as a starter from Opening Day forward, there will be a development curve. This is all before accounting for the inevitable flow of injuries and performance issues as well. So while it would an overexaggeration to say the starting pitching staff is in peril, characterizing it as a high risk property is fair. The approach that would be most prudent would be to stay active in the pitching acquisition market. This is a varied approach that could range from adding a competitive depth option that can compete for the fifth spot, a still rehabbing arm that can get in the mix as the season goes along or going all in on a front line acquisition such as Max Scherzer, Cole Hamels or James Shields. The options are varied and plentiful, but one thing that this for certain is that with all things considered headed into the spring, further additions of some sort to the team’s starting staff is not a negotiable issue. You can find Matt on Twitter right here, dishing takes on a variety of topics. There it is folks. Five different perspectives from five supremely talented minds. People that I look to when I need constructed criticism or a fresh opinion. What do I think? I understand the need for insurance. The rotation does have some creaky and leaky areas that could bust open at any moment. There hasn’t been a season without at least 1-2 starters hitting the bricks. I wouldn’t touch Scherzer’s zip code with a ten foot stick, because he is 30, heading for a Tommy John appointment any pitch now and way too expensive for a guy who will only give you a quality start(aces don’t do that). Price is the most polished of the group, but on a one year layover I don’t give up the prospects UNLESS there is an extension in the works. Mo is smarter than that. Hamels is the most appealing of the group overall, because he does have the four years and gives the team a deadly top tier lefthanded pitcher for the deep run. He can step in if Waino gets hurt. I wouldn’t be opposed to a Cole Hamels trade. He is 31 years old, pitched great in 2014 with a bad team and has mileage left. If one of the top three is presented, I take Cole. Then again, he has over 1,800 innings pitched and has a hazard warning hanging over his head like Scherzer. I wouldn’t mind the Cards entering the season with what they have. The model of recent years has been build from within. Carlos Martinez deserves a real shot to start. Marco Gonzales isn’t ready to provide 180 innings but he is a promising talent who made huge strides in 2014. Tim Cooney, Tyler Lyons and John Gast also lie in waiting. If a need comes up, you can go fishing at the deadline. I am sure the price for Hamels and Price will be stiff now or in July. I believe that the Phillies will want Martinez and so will the Tigers. That’s just me. Do you give that up, along with several other pieces? I try not to overvalue young prospects, but I don’t see Carlos and Marco as prospects anymore. They are Major League caliber pitchers. They just need time. In the end, it really depends on what the other teams are asking for. It’s so hard to draw a line, but if I had to right now, I would stay with what I got and keep an eye out in spring training for a lower rotation innings consumer if a real need develops. I don’t think a big name is needed, even when weighing the hazard signs in the rotation at the moment. I’m ready to eat my words later if needed but I trust that Mo makes the right call and doesn’t make a big trade or deal unless there is a real need for it. I don’t think the Cards trade Shelby Miller, a young healthy pitcher, if they had real concern over Waino and Wacha. I stand firm with my young pitching and lean on veterans like Lynn and Lackey if the ship is rocked. What do you think Mozeliak and the Cardinals should do? Give me your take in the comments section below.